Tupolev Tu-16 (Russian: Туполев Ту-16; NATO reporting name: Badger) was a Soviet twin-engine heavy bomber designed by Tupolev. ↑ User, Super. "Предприятие". www.vaso.ru. Archived from the original on 6 May 2018. Retrieved 6 May 2018. ↑ "VectorSite". 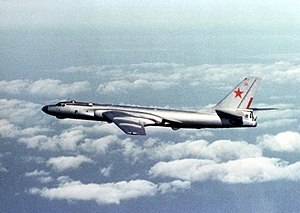 The Tupolev Tu-16 "Badger". Archived from the original on 2012-04-18. Retrieved 2007-01-12.